d we are very proud to bring it to you. The way it works is quite simple. One hour before the appointment you simply take a pill that we have dispensed to you. By the time you arrive for your appointment you are very relaxed. You are then shown to the dental chair. You gradually progress to a deeper level of sedation but are still able to respond to your environment and to questions from the doctor. Your vital signs are monitored constantly throughout the treatment. When you’re finished, a friend drives you home and in an hour or so you are pretty much back to normal. You aren’t “knocked out” or in total sedation like you would be for surgery. The level of sedation isn’t that deep, but just deep enough so that you feel nothing but are still conscious. We find that while some patients have a deep fear of dental treatment, they may also have a deeper fear of being “put under.” Their actual fear centers on losing control or not being able to perceive what’s going on around them. Conscious sedation is a happy medium. You are still under control and understand what’s happening – you just don’t feel anything or have any anxiety about it. Some people, while they are not at all afraid of dental treatment, are highly resistant to anesthetic. They just can’t get numb. Other people simply don’t have the time to make repeated visits to the dentist and would rather have all their work done in one longer visit. 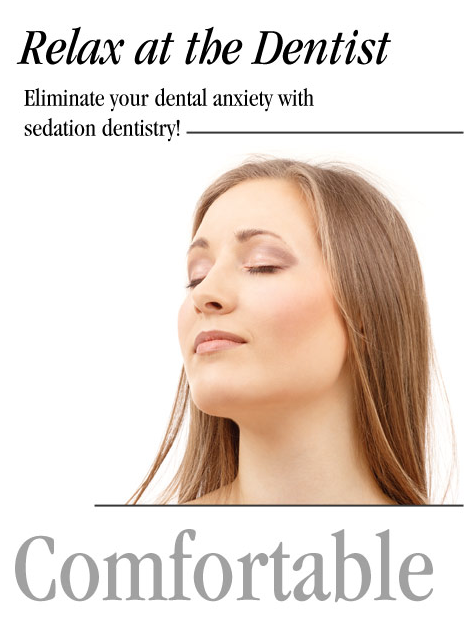 Conscious sedation dentistry takes care of both problems. With conscious sedation dentistry, literally years of treatment can be accomplished in just a single visit! We look forward to working with you to provide you with quality dental care in a comfortable, relaxed manner. Call our office at (941) 359-2151 to find out more about sedation dentistry.